Welcome back to our Sewing with Knits series! In our first post we talked about beginner basics that went over the essentials of what you need to know about sewing with knit fabrics. 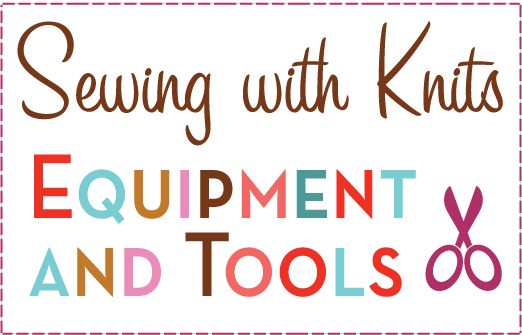 Today we are going to focus on the basic equipment and tools to use when sewing with knit fabrics. A regular sewing machine is all you need to sew with knits. There are many different specialty machines out there specifically for sewing with knits, but a regular sewing machine is all you need! upper tension can be adjusted just like with woven fabrics. You can sew on knits using a regular needle and sewing foot, but for more delicate knit fabrics you can use ballpoint needles. These have a rounded tip that can help avoid making overly large holes in knit fabrics. A basic straight stitch can be used for sewing with knits, but you want to use a longer stitch length. This not only allows your knit fabric to stretch a bit once it is sewn, but it avoids puckering with your stitches. A handy stitch to also use is the reinforced straight stitch if your machine has it. It is good for crotch and armhole areas that require strength but still allow for stretch. Since knits do not fray you do not have to finish the edges, but if you wish to do so use the zig zag stitch. Follow the instructions in your particular machine's instruction book if you are not familiar with how to use these other stitches. Regular sewing thread can be used with knits. The cotton poly thread found in your local craft supply store works for most knits, but if you need a lot of stretch for your selected fabric, say for work out wear or a bathing suit, you can use a stretchy thread called "wooly nylon" in your bobbin. Using one of your machine's stretch stitches wind the nylon thread by hand in your bobbin (make sure not to stretch it) and sew with regular thread for the top stitch. Ballpoint needles are also handy for pinning your knit fabrics if they are lighter weight, but regular sewing needles do the job just as well. If you have any questions, be sure to leave them in a comment below, email us, or contact us through our website. Next up in our series, we’ll discuss the different types of knits, their characteristics, and choosing the right fabrics for your project. A walking foot is also very helpful if you have a couple layers of slippery knits. I'm sewing a top using your peach burgundy floral cotton jersey knit fabric. My pattern says for knit garments I need to stretch the fabric slightly while stitching. Do you recommend this also? I'm not sure because this is my first knit project.